***The products are all products which I like myself. I haven't bought them yet. As some of you know, the Delhi heat is melting some of my makeup products, so I don't wanna risk it. I want them to be all BRAND NEW & FRESH when I send them to the winners. The prizes below are for the winner from the 1st category. Giveaway will end on the 12th of June,2010 at 12:00 am IST and winners will be announced shortly after that. hey cynth happy birthday! too lazy joining contests but this thing i cant let pass! we dont have those brands here & i wanna try lakme cosmetics. i just placed an ad about your contest on my side bar. Enter me hunna! :D It goes without saying that I love ya blog. 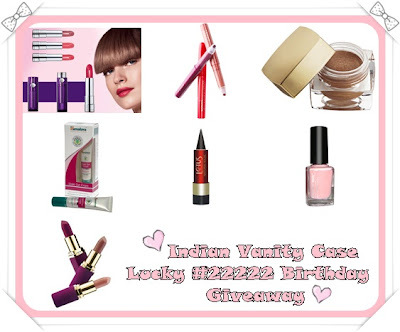 i love your giveaway - ive heard so much about lakme, but it never seems to be available here! Pls enter me for this giveaway!! I tweeted about the giveaway and I'm following you on twitter - http://twitter.com/kirti_writes. I like that your reviews are short and to the point and i love to c the posts in which we get to see the lovely lady herself, also i love your frequent hauls..!! thought hard but there's really nothing that i dont like..!! I'd like to see more Fotds, Eotd, Ootd kind of posts.. they are fun.. also it would be great if you could do some tutorials..!! I'm already a folllower so I'd love to enter!! Happy birthday to you doll!!! i think i emailed u...beginners skin care kit..:)..cheers..
you know i am a follower here and on twitter.. right? I follow you now! Please enter me. Enter my giveaway when you get a chance- it ends Sunday! I'm already a follower on Twitter and on blog too. enter me pls! am a follower and happy happy bday!! i am a new reader of ur blog and must say a HUGE NEW FAN. simply love ur reviews and ur style of writing. i am a dentist by profession (MDS). i have been studying dentistry for the past 10 yrs n never found time for anything else. but now..i think makeup is becoming a passion. and what better way but to get help from ur blog. ur doing a great job gal!! keep it up. but i sincerely hope u'll take notice of this new fan. @Shikha~ Aww...thank u so much! Oh how can I not take notice?! lol. Never mind about Twitter :). Hi Cynthia...I'm a huge fan of your blog!...Love reading ur posts but a bit lazy to comment ;)...Please enter me into the giveaway...I would love to see more OOTDs...You looked really cute in the one you did :)...it would be great if you could put up the prices of the apparel too...As for what I dislike...I don't dislike anything abt ur blog!! ooohhhh... I hope I am not too late!! I wanna participate! Thankyou for the opportunity so excited for this !! I'm following you using bloglovin and i did mention your giveaway among other give aways on my dutch blog http://www.maccia.nl/wordpress/?p=961. Following you obviously and will post this on my sidebar soon. I'm finally here! Count me in please. I've put a link to your giveaway on my sidebar. You know my contact details. :) Thank you!